She said it took seven hours before villagers carried her on a stretcher to a dispensary. “When I reached there, the doctor who was on duty said that I should be returned home because I was already dead,” Staford said. Two years ago, in an effort to counter such attacks, the Office of the High Commissioner for Human Rights appointed Ikponwosa Ero as the first U.N. independent expert on human rights of persons with albinism. 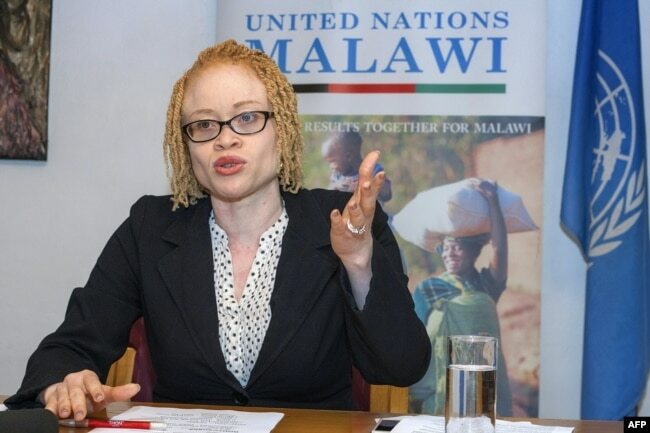 FILE – The U.N.’s independent expert on human rights and albinism, Ikponwosa Ero, addresses a news conference at the end of her official visit to Malawi on April 29, 2016. Ero, of Nigeria, also has albinism — an inherited condition that affects the pigment of the skin and hair. She said attacks, mutilation and murders occur because of the false belief that albino body parts can bring wealth and good luck. Ero told VOA that she has documented close to 800 cases of attacks against albinos in the past decade in sub-Saharan Africa, where such witchcraft-related violence is most common. “Those are reported cases alone. Most cases are not reported because most cases involve family members or people known to the victim,” Ero said. She said the practice thrives because there is a lot of money to be made. “The Red Cross reported that the body parts were valued on the black market. Like an arm was valued at $2,000, and a complete corpse at about $75,000. So, there are profits to be made even though you do not believe in witchcraft,” she said. Though it is the witch doctors who drive this trade, they rarely are brought to justice. Ero said there were very few witch doctors among the prisoners she met during two visits last year to Malawi and Mozambique to assess the situation of people with albinism. ALSO READ: The Traditional Healers of Malawi Deny Link to Albino Killings. “Societies are afraid of them,” Ero said. “The police are afraid of them. So, those are usually not prosecuted. No one has paid for the crime committed against Mariama Staford. Staford has suffered other repercussions, as well. When the attack occurred, she was six months pregnant. She lost her baby. She told VOA she also must live with the suffering of her son who, as a two-year-old child, was forced to witness the horrific attack against his mother. Staford said there should be stringent laws against any person who attacks people with albinism. She also would like to see the government take away licenses to practice from witch doctors.